It was one of those moments when your heart skips a beat and the world slows down and seems to stop. A few weeks ago I was flipping through TV channels looking for something to watch and stopped dead when I hit the preview for Silver Screen Classics. Now of course seeing any hand with a paintbrush would make me stop but my breathe was taken away when the camera panned out and I realized I was watching Group of Seven artist A.Y. Jackson create a masterpiece. Rather frantically I hit the record button and was able to get part of the 1941 film called Canadian Landscape. After I calmed down and watched it for a second time I realized that I might be able to find the entire thing somewhere on the internet. 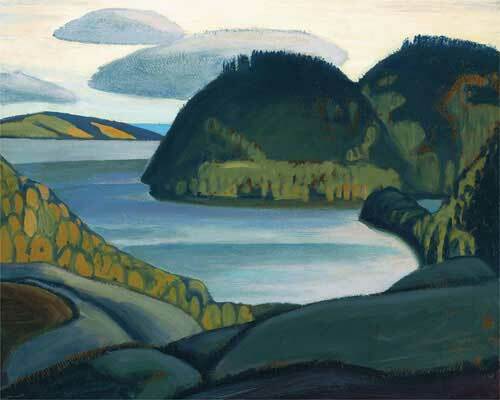 And sure enough, when I googled “Canadian Landscape”, it led me to The National Film Board of Canada website. I love the old documentary films from the NFB anyway, but this was very special gift because it’s as if A.Y Jackson comes alive again and allows us to get more than a glimpse of his techniques and his thought process. 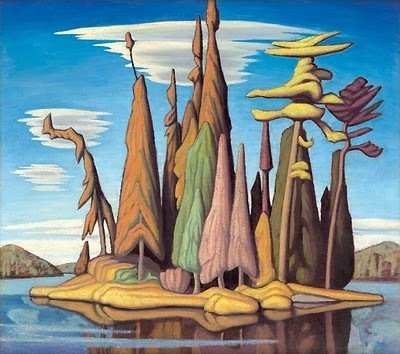 Yes, I’ve read books about the Group of Seven and about the artists as individuals but seeing and being able to hear Jackson’s own voice was like a personal visit in my living room, a visceral way of getting to know much more about one of the artists I so deeply admire. The narrator explains Jacksons daily schedule and how Northern Ontario in the fall is his favorite time to paint. The aged quality of the film causes scenery to be indistinct making it seem like the film could in itself be a series of Jacksons paintings. The narrator talks about “the artists tussel with nature to select only the core of what he sees” and that “the artists job is to examine the pattern of nature and then to get at its basic design”. AY himself talks about how he uses “sketches” (small quick paintings), “not as a little picture but rather as an idea for a big one” and “what you always strive for is an intesification of nature”. “So often the northern landscape is a crowded confusion of shapes and colours, and you have to reduce it to some kind of order” speaks directly to what I try to encapsulate in my own art. And the most exciting thing about my visit with A.Y.? If one film like this exists, perhaps there are other or similar works about him or other members of the Group of Seven. If you know of any please be sure to leave a comment and a link! The video also makes me very proud to be a New West artist and to say that my work is Made in New West. I have found with painting that I’ll have an idea mulling around in my head for days, even weeks. And then suddenly I just know what I want to paint. This video illustrates why allowing time and not rushing the creative process is so important. In 2011 I was in Ottawa for a medical conference and was able to spend half a day at the National Gallery. 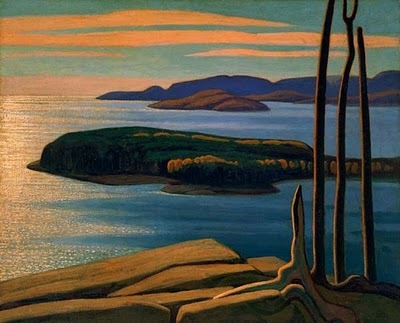 I had always admired the Group of Seven but it wasn’t until I was face to face with the real paintings of the seven that I understood what tremendous artists they were. 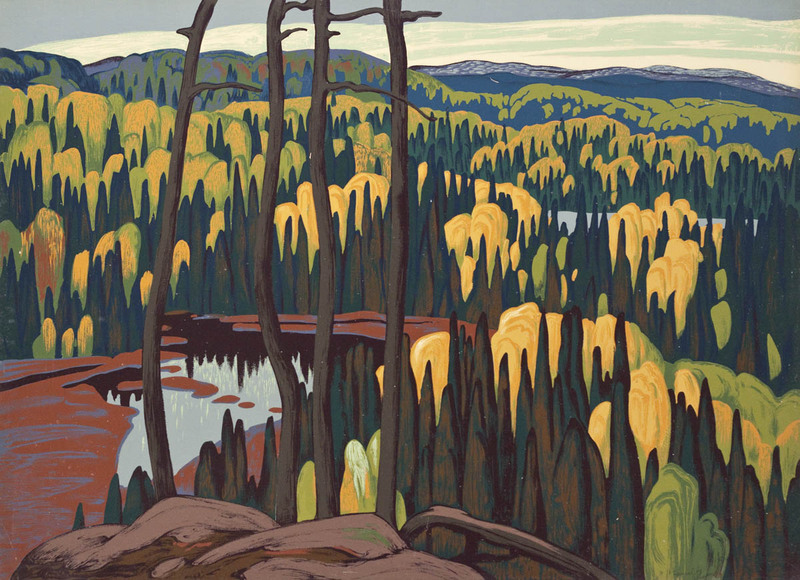 I was nearly moved to tears by the works of Lawren Harris and Tom Thompson. While there I sketched madly and promised myself that I would do more art, that I would try to start to paint-real painting, fine art on canvas. And for the past year I have. When my PaintFest painting, A moonstruck westcoast was hung on the wall at BC Children’s Hospital one of the physicians said to me, “It looks like something done by one of the group of seven.” His complement took my breathe away. I was given the gift of being compared to my greatest inspiration. It’s what every painter desires and I don’t think it can get any better than that. This painting showed me how to think about how distilling trees and landscape into basic shapes. It was also my inspiration for using yellow for highlights. A lot of my painting colour palette comes from this vibrant piece. 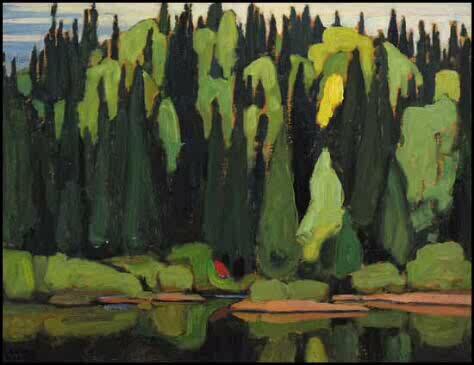 The painting that convinced me that if Lawren Harris didn’t have perfectly shaped trees then I didn’t have to either.